I have always wanted to make risotto, but with two young children, standing and stirring and babysitting rice for an hour is just now feasible. Then, I discovered that risotto could be made in the slow cooker, with out stirring! Hooray! I was finally able to make risotto! This risotto is pleasantly spicy with a little sweetness, due to the squash. I served it alongside chicken marinated in Hunter’s Choice Marinade and it was a truly excellent combination. 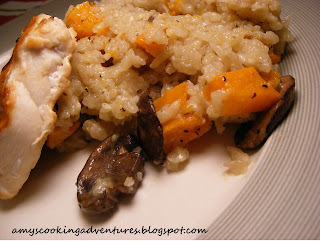 I really love that risotto is extremely versatile, so you can really shake things up. Don’t have squash? Try sweet potatoes. Don’t like mushrooms? Leave them out! 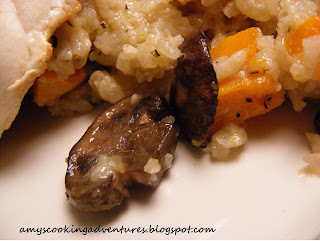 Be creative, feel fancy, enjoy your risotto. In a large sauté pan, heat 2 tsp olive oil. Sauté onions and mushrooms until tender, about 5 minutes. Add garlic and sauté 1 minute more. 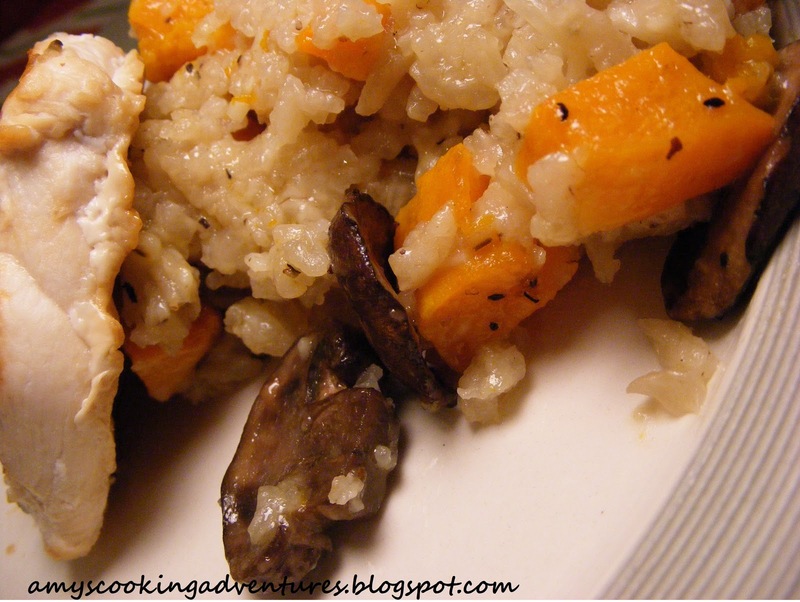 In the crockpot, mix ¼ cup olive oil, rice, and mushroom mixture. In a medium bowl, whisk thyme, black pepper, and sea salt into the chicken broth. Pour over the rice mixture and stir to mix flavors. Cover and cook on high for 2 hours. Check if the rice in tender. Stir and cook for 3o more minutes to complete cooking (if necessary). Stir in the roasted squash and parmesan cheese.